Que Sera Farm is located 7000 feet above sea level, nestled at the foot of the towering Sangre de Cristo Mountains just 20 minutes south of the historic Santa Fe Plaza. Our location in the high desert plateaus of northern New Mexico affords us cool summer evenings and cold dry winters - perfect for these fleece producing animals. 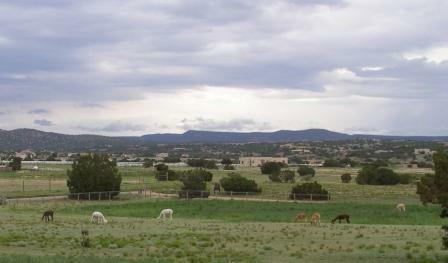 New Mexico is a land of big skies, grand vistas, enchanted out-of-the-way places, clean air and lots of sunshine. It is also home to some of the finest quality alpacas in the United States. At Que Sera we strive for excellence in everything we do. 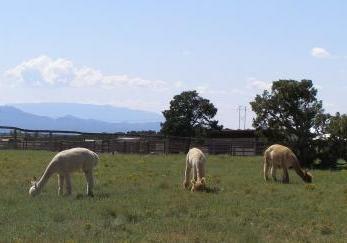 We are committed to breeding the finest Huacaya alpacas. Just like every other alpaca breeder worth their salt, we look for microscopic micron, impressive density, long staples, well organized bundles and consistent crimp, and, of course, blinding brightness. But beyond that we are specifically focused on perpetuating the fineness and density we are currently producing... that is, we look for genetic lines that hold their micron count within 4 to 5 micron throughout their lives. 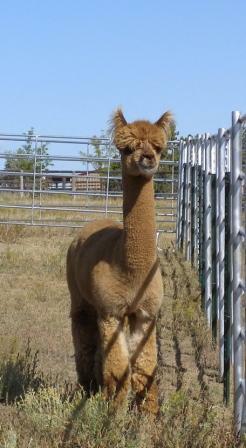 For instance, our primary herdsire, Altair's Vito, was born with a 17 micron and at 66 months won Color Champion at the 2010 Great Western Alpaca Show. Anne is a bona fide fiber nerd. She has studied with Ruth Elvestad to learn how to sort and grade alpaca fleeces, She spins and crochets and dabbles in needle felting and dyeing. When I was just a little girl, I asked my mother ... 'What will I be? Here's what she said to me..."
"Que Sera, my dear - the future's not our see, whatever will be, will be." One thing is certain though - she never foresaw alpacas. She, for sure, never said "Some fine day you will discover the joy of raising alpacas."